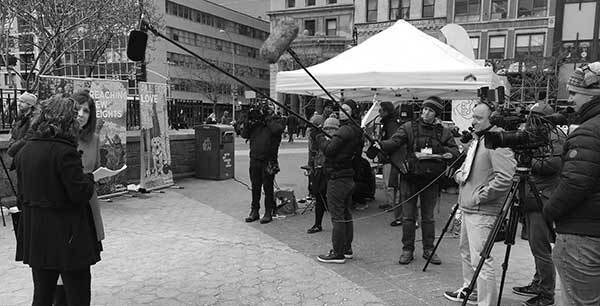 When Petco Foundation asked us to broadcast segments from their Everything For Love pet adoption event in Union Square NY to their Facebook Live pages, it presented a few unusual challenges. The Main Problems: No power and no internet connection. The Solutions: A generator and a TVU One device. Managing producer, Eric Wolfram, debriefs us on some of the details below. 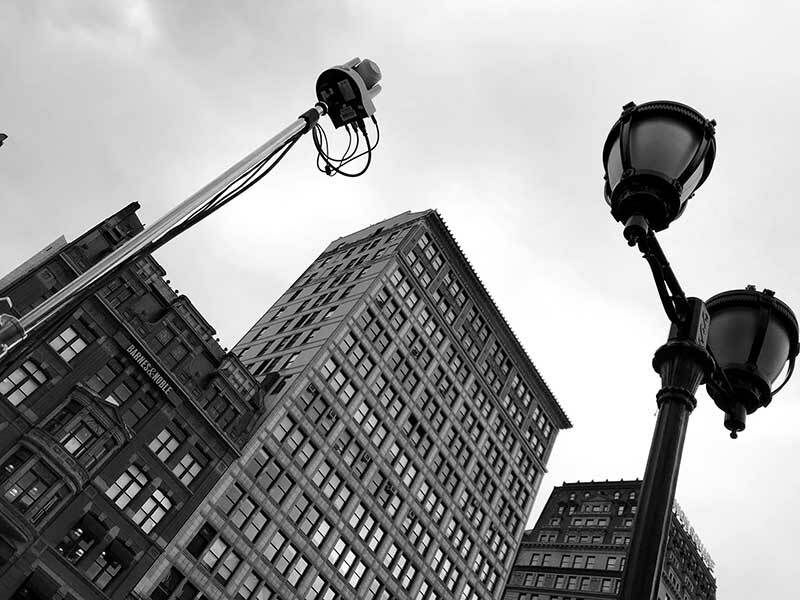 We used a TVU One device, which transmits video over cellular networks. Ours had four cellular modems and accounts with T-Mobile, Sprint, Verizon & AT&T. 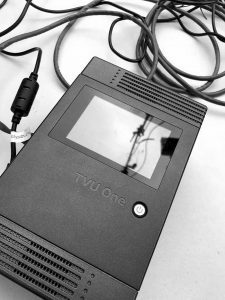 It was simple to use because we used the device in “router mode”, which means we could plug our ethernet cable from our Tricaster switch into the TVU One device and — boom — we had 30MB/Second up and 15MB/Second down. Not only that, it provided a wireless network for our social media computer to connect too during the event. We rented a small Honda generator, one of their inverter generators, that hums relatively quietly because it only revs up to full power when the amps are needed and otherwise chugs along softly, the sound disappearing into the other city noises. Although they are designed to support “sensitive equipment” like computers, we still ran that power through an Uninterruptible Power Supply (UPS), which came in handy for several reasons. We bought a consumer version of UPS from Amazon that cost around $100. It acted as a surge protector and we figured it also would treat or clean the power from the generator. We had no problems. We could literally unplug the generator and the Tricaster and internet would continue to operate. This enabled us to fill up the generator with gas, when needed, without keeping the generator running. We used two Teradek Bolt 500s to wirelessly transmit video from the camera crews to our Tricaster switch. This gave our crews some freedom to wonder the event without being tethered to the mothership. Maybe the frequencies in Union Square NYC were taken because these Eartec Cams were the most problematic piece in the puzzle. They didn’t work in Union Square as well as expected. People couldn’t wander very far from the hub before we lost connections even though we had the hub on a C-stand about 8 feet in the air. In retrospect, I would have taken the hub off the power and used battery power so a PA could stand with the hub about half way between the crew and the tent. Still, they worked well most of the time. 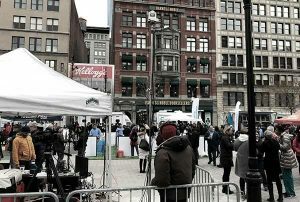 We sent a remote control camera up a c-stand to get overhead and wide shots of the event. This camera was controlled by the Tricaster switch operator. The Tricaster switch enabled us to switch between cameras, overlay graphics downstream of the edit, and also record on b-roll that we could play later during the interviews. It also recorded the switched master in HD and compressed the switched master to send to Facebook Live via the TVU One device. Petco Foundation wanted this to stream to their Facebook page but they also wanted it to stream to the corporate Petco Facebook page at the same time. So we accomplished this by using a service called restream.io. After some testing with Facebook’s new “persistent keys”, we were able to determine that this was possible. Although there were a few issues, we discovered the work-arounds that made it possible with minimal hassles. 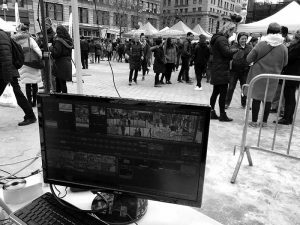 If you’re looking for someone to help live broadcast your remote or outdoor event to Facebook Live or elsewhere, we have the experience, the truck, the gear, and the crews to help. Reach out for a quick quote right now.